USES: This medication is used to treat fungal infections of the skin, hair, and nails that do not respond to creams/lotions. Clearing such infections will get rid of symptoms such as itching, red/peeling/scaly skin, and discolored nails. This medication works by stopping the growth of fungi. It does not treat infections due to bacteria or yeast. HOW TO USE: Shake the bottle well before each dose. Take this medication by mouth as directed by your doctor. For the best absorption, it is best taken with or after a meal containing a moderate amount of fat. Talk to your doctor or pharmacist about specific dietary instructions, especially if you are on a low-fat diet. The dosage is based on your medical condition and response to therapy. In children, dosage is also based on weight. The length of treatment depends on the type of infection you have. It may take several weeks to months to complete treatment for infections of the scalp, feet, and body. Nail infections may require several months to a year or longer to treat. Antifungal medications work best when the amount of medicine in your body is kept at a constant level. Therefore, take this drug at evenly spaced intervals. Continue to take this medication for the full prescribed length of treatment even if symptoms improve after a few days. Stopping the medication too early may allow the fungus to continue to grow, which may result in a relapse of the infection. Inform your doctor if your condition persists or worsens. SIDE EFFECTS: Headache, nausea, vomiting, diarrhea, stomach upset, tiredness, dizziness, or trouble sleeping may occur. If any of these effects persist or worsen, notify your doctor or pharmacist promptly. Remember that your doctor has prescribed this medication because he or she has judged that the benefit to you is greater than the risk of side effects. Many people using this medication do not have serious side effects. Tell your doctor immediately if any of these unlikely but serious side effects occur: numbness/tingling of the hands/feet, mental/mood changes (e.g., confusion, trouble doing normal activities), sunburn-like rash, hearing changes, butterfly-shaped facial rash (around the nose and cheeks), joint/muscle pain. Tell your doctor immediately if any of these rare but very serious side effects occur: yellowing eyes/skin, stomach/abdominal pain, persistent nausea/vomiting, dark/frothy urine, change in the amount of urine, signs of infection (e.g., fever, persistent sore throat). Use of this medication for prolonged or repeated periods may result in oral thrush or a new vaginal yeast infection (oral or vaginal fungal infection). Contact your doctor if you notice white patches in your mouth, a change in vaginal discharge, or other new symptoms. A very serious allergic reaction to this drug is unlikely, but seek immediate medical attention if it occurs. Symptoms of a serious allergic reaction may include: rash, itching/swelling (especially of the face/tongue/throat), severe dizziness, trouble breathing. This is not a complete list of possible side effects. If you notice other effects not listed above, contact your doctor or pharmacist. In the US - Call your doctor for medical advice about side effects. You may report side effects to FDA at 1-800-FDA-1088. In Canada - Call your doctor for medical advice about side effects. You may report side effects to Health Canada at 1-866-234-2345. PRECAUTIONS: Before taking griseofulvin, tell your doctor or pharmacist if you are allergic to it; or if you have any other allergies.This product may contain inactive ingredients, which can cause allergic reactions or other problems. Talk to your pharmacist for more details. This medication should not be used if you have certain medical conditions. Before using this medicine, consult your doctor or pharmacist if you have: a certain blood disorder (porphyria), severe liver disease (liver failure). Before using this medication, tell your doctor or pharmacist your medical history, especially of: lupus. This drug may make you dizzy or less alert. Do not engage in activities requiring alertness such as driving or using machinery until you know how this drug affects you and that you can safely perform these activities. Avoid alcoholic beverages while you are taking this drug unless your doctor gives permission. Drinking alcohol during treatment with this drug could result in a fast heartbeat and flushing of the skin. This medication may make you more sensitive to the sun. Avoid prolonged sun exposure, tanning booths, and sunlamps. Use a sunscreen and wear protective clothing when outdoors. This medication is not recommended for use during pregnancy. It may harm an unborn baby. 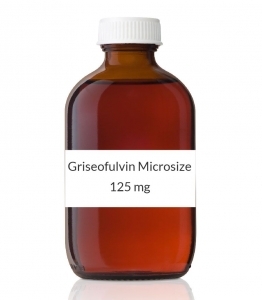 Consult your doctor for more details and to discuss delaying griseofulvin treatment. Use of reliable form(s) of birth control is recommended during treatment and for 1 month after the drug is stopped. If you are planning to become pregnant within 1 month after treatment, the manufacturer recommends avoiding this drug. (See also Drug Interactions.) The effects of this drug on human sperm are unknown. However, based on animal cell studies, the manufacturer recommends waiting for a period of time after completing griseofulvin treatment before trying to father a child. Discuss the risks and benefits with your doctor, and ask how long to wait after your last dose before trying to father a child. It is unknown if this drug passes into breast milk. Consult your doctor before breast-feeding. DRUG INTERACTIONS: Your healthcare professionals (e.g., doctor or pharmacist) may already be aware of any possible drug interactions and may be monitoring you for it. Do not start, stop or change the dosage of any medicine before checking with them first. Before using this medication, tell your doctor or pharmacist of all prescription and nonprescription/herbal products you may use, especially of: barbiturates (e.g., phenobarbital), warfarin. This medication may decrease the effectiveness of hormonal birth control such as pills, patch, or ring. This could cause pregnancy. Discuss with your doctor or pharmacist if you should use additional reliable birth control methods while using this medication. Also tell your doctor if you have any new spotting or breakthrough bleeding, because these may be signs that your birth control is not working well. This document does not contain all possible interactions. Therefore, before using this product, tell your doctor or pharmacist of all the products you use. Keep a list of all your medications with you, and share the list with your doctor and pharmacist. NOTES: Do not share this medication with others. This medication has been prescribed for your current condition only. Do not use it later for another infection unless told to do so by your doctor. A different medication may be necessary in those cases. Laboratory and/or medical tests (e.g., kidney and liver function, complete blood count) should be performed periodically to check for side effects with prolonged treatment. Consult your doctor for more details. Ask your doctor or pharmacist about ways to control the infection and to prevent re-infection. Fungus spreads easily in warm, moist areas. Follow good hygiene (e.g., wash and dry the infected area completely, and do not share articles of clothing or objects that come in contact with the infected area).